A while back I had an interesting exchange with Chris Schwarz and Marc Spagnuolo about how to squeezed more wood working time into my days. I got many great suggestions (decline raises at work for time, get rid of cable, have realistic shop goals, etc). Some, I was already doing. Some I want to implement right away. One of the suggestions was to make a sharpening station for inside that would allowme to sharpen while hanging out with the fam in the living room. 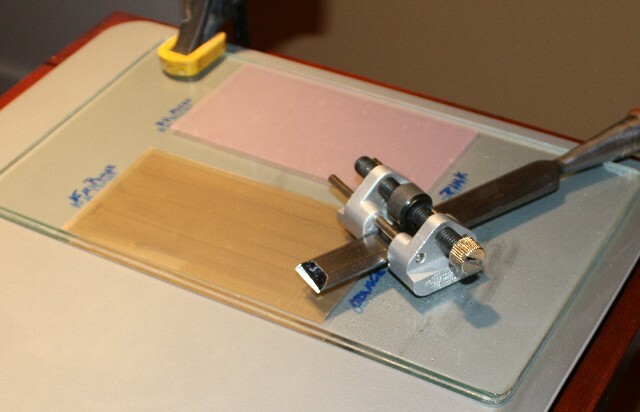 The very next day, Chris posted this link on his Popular Woodworking Blog – Sharpening with Diamond Lapping Film. So here’s my attempt at implementing that suggestion. I went over to Hardwick’s (our local have everything hardware store). 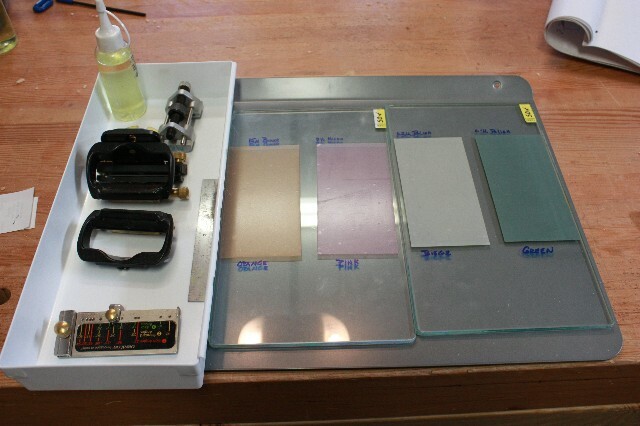 I picked up two small used plate glass squares, a baking sheet and a small plastic container. Chris said that he had a lot of troubles with the Diamond Lapping Film and bubbles underneath. Even with a great deal of care and a rubber roller, I had the same problem. Here’s what the final set up looked like on the jumbo baking sheet underneath to keep the oil in its place. Looks like an elegant solution to fitting more woodworking hours into the day. So instead of knitting in front of TV, you can sharpen and hone. Kind’ve reminds me of that old Popeye cartoon, where for relaxation, he is sitting on the deck knitting anchor chain with a pair of needles. Well done you. Are you using oil on the diamond film? How long does the film last? I did some sharpening with abrasives from TFWW, and had great results but the abrasive dulled very quickly (a few strokes and each area was dulled). I re-read Chris’ blog post, and looked at Lee Valley — both recommend oil, I missed that. It sounds like it should hold up a lot better than silicon carbide paper, I’m going to order some to try. As far as getting it stuck down without bubbles, there is a trick that might help. Spray the glass with a soapy water solution, place the adhesive side of the film on top of the water, and cover that with a piece of waxed paper. Use a plastic squeegee, working from the center, to squeeze all of the water out. You will be able to squeegee out any bubbles. They use the same procedure to put vinyl stripes/graphics on cars. I’ve only sharpened a couple of things with the film and so far its holding up well. Soapy water and a squeegee is a great suggestion. If you do end up ordering some and applying it that way, I’d love to know how it turns out.